room features like fireplaces, high ceilings, picture railings etc. To update a house in Charlotte, North Carolina, designer Lindsey Coral Harper put a sofa in the kitchen, painted dated wood paneling a bold blue, gave every bedroom an upholstered headboard, and used color throughout. Read the full interview with Harper for more of her decorating ideas. In the entry, walls in Phillip Jeffries's Moroccan on Manila Hemp grass cloth are grounded by the brown wainscoting. I love the use of over sized lamps to add importance to the entry. Additional grandeur has been created by using hemp grasscloth over chocolate painted walls below the white crisp railings. You could get the same effect using a wall stencil. Get more wall stencil ideas here. 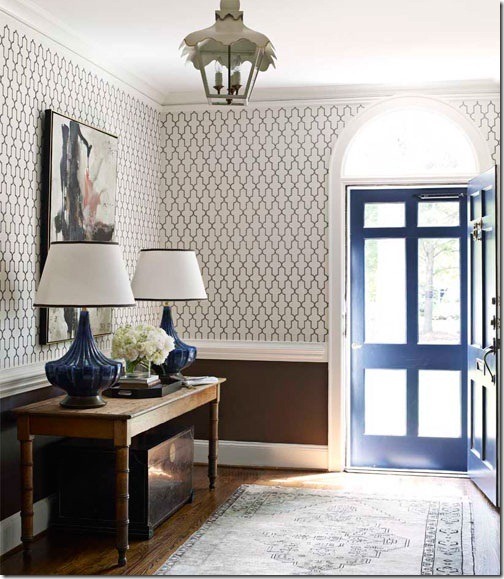 The combination of wall colors has not only brought interest but makes the entry look and feel bigger and lighter. The use of warm wall paint tones in the table and chest gives an additional layer. Painting the paneled walls and cabinets of the library deep blue gave a sliver of a room impact. So much can been done with paneling and every bit as stylish. Chalked, limed or painted - all good, depending on your style and taste. 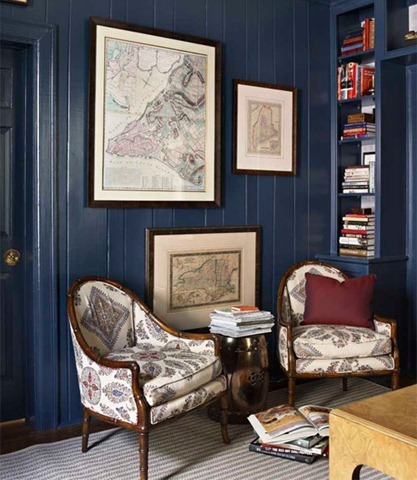 Here the wall paint color used is a great strong, blue color bringing the walls closer, making the room feel more intimate - perfect for a study or home office. Natural Curiosities print by Paule Marrot loosens up the formality of the family room. Armchairs in Brunschwig & Fils' Tavistock Stripe. The paint color selected makes this room feel spacious and elegant. 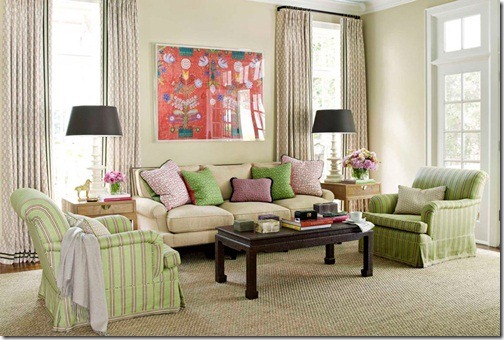 The room is lifted with the use of color and texture with lime greens in the cushions and sofas and pinks/reds with painting and cushions. Long curtains emphasize the long, elegant windows and are in soft tones to blend in with the walls. She painted guest-room walls Benjamin Moore's Stem Green: "It immediately made this simple little space so happy." Farrow & Ball's Drag paper is cool and calming in the master bedroom. This bedroom has papered grey walls. 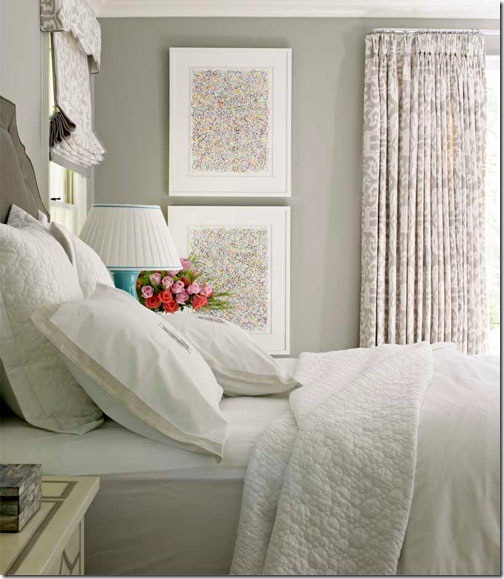 White has been used extensively on frames, bed linen and surrounds to offset the coldness some grey paint color can create. To freshen the dining room of a 1940s Charlotte, North Carolina, house, designer Lindsey Coral Harper hung a Glass Bubble chandelier from Homenature over a custom lacquered table, covered walls in green grass cloth from Sonia's Place, and backed Hickory Chair's Cabriole side chairs in Petite Fleur by Michæl Devine. 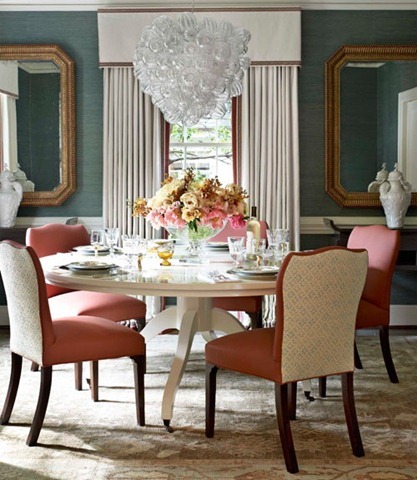 The strong deep green grass walls creates the perfect backdrop for this formal dining room. While it appears that wall paper has helped to create this textured backdrop, it could easily be done with paint color. 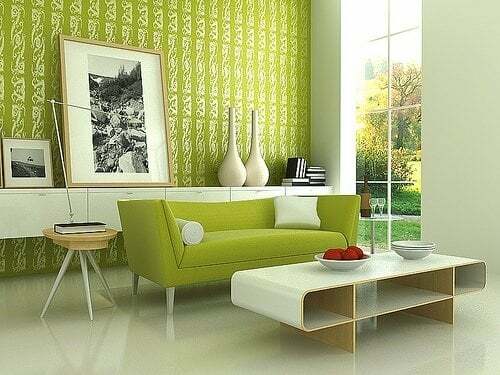 Different shades of white in curtains, table and woodwork, lift the deep green. Gold frames and curtain detailing add to the formality and grandeur. Changing the white woodwork to a glossy chocolate or very pale yellow can change the look fast. Harper made a Roman shade in the same fabric as the kitchen sofa, Thom Filicia's Prospect in Shadow for Kravet, to carry the ikat pattern across the room. Grey and white are popular kitchen choices. The yellow accents helps to lighten the muted, elegant look. This look can be easily changed with a new curtain sporting deep thick, red and white stripes, french blue and white or black and white - updating it quickly and inexpensively. It's hard to tell from this photo but the kitchen walls are deep yellow (see below). 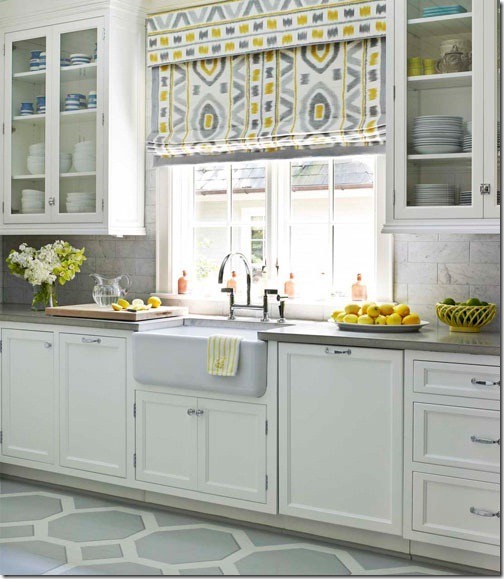 Bright yellow walls — Benjamin Moore's Inner Glow — and an even brighter citron table from HB Home brought the white-and-gray kitchen to life. Harper turned wire side tables from ABC Carpet & Home into stools. 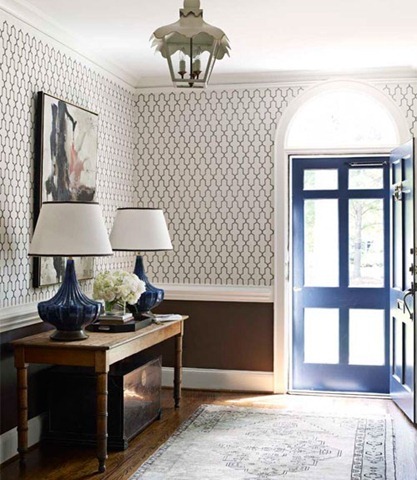 Dark brown floors were transformed with a large geometric pattern, painted by Jay C. Lohmann. Pendant light from Robert Abbey. Hugo Guinness prints from John Derian. Placing a sofa in the kitchen is very cool - after all, the kitchen is where most of life happens. But not everyone has the space. In this case, the sofa is upholstered in the same fabric as the curtains. This is not so difficult when you know how. Here is a quick upholstery lesson. The vibrant deep yellow walls add life to what could be a dull room. I love these wire stools - they keep the space airy and light, whereas chairs could be too heavy. Great bright yellow table; amazing legs. But what do you think about the shape? I would prefer a square table - slightly more practical... for me. You can read the complete article and see more photos at House and Garden. If you have a way of selecting your best wall colors let me know. I love simple techniques that can create cool home decor by changing the look and feel of a room. 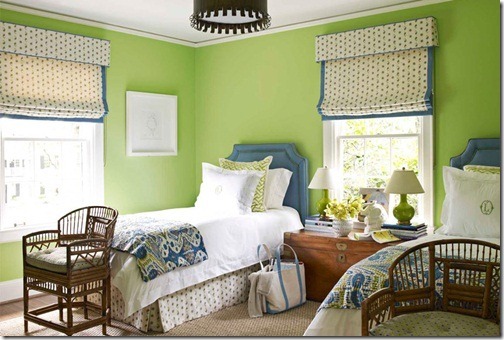 Rooms should inspire and make you feel like you are living a Decorated Life! So leave a comment - then Like us on FB and above all - share - it's free!